How often does your child's future cross your mind? Do you ever find yourself thinking about how you are going to pay for his college education? Or what kind of adult he will be? If you're not much of a planner, then chances are none of these things have crossed your mind yet, and that does not make you a bad parent. Even if your child is under the age of 5 or 2, it is never too early to give him the best chance for success. The earlier you start planning your child's future, the better. I am a mama of 3, so I constantly stress about my kids' futures. I want them prepared for the college journey, successful adults or at least prepared for adulthood. My biggest fear as a parent is that I will fall short in making my child with the essentials she needs to take on the world. What qualities do we hope to find within our children? We as parents have to work overtime developing and nurturing attributes in our offspring. To prepare our children for their journey, we must help them. They will need help pointing them in the direction of their goals and some common sense tips for when the road gets tough. My mom is not an avid book reader; however, I am. It wasn't until summer 2005 that I fell in love with books. I made a pledge to myself when I became a mother to expose my children to the world of books. Luckily my kids love books. Though their love of books could be because the books are colorful and full of pictures of their favorite characters. Today's children are consumed with technology. It's so easier to give a child a tablet just to buy mom or dad at least 20 minutes of silence. Education does not begin and end within the walls of a classroom; it extends to home as well. When our children get to be school age, we must remain active and vigilant in their lives as ever. We must make certain that they are in the most stimulating classes and are being encouraged by their teachers. Since I've been successfully adulting, for the most part, I have noticed either my ex coworkers or old classmates having less success. Since I was a child, my father constantly embedded in my mind the importance of credit. Credit rules the world and without it you are stuck. Unable to get an apartment in your name, or buy a car. I've also noticed their lack of drive, even when they have dependents of their own. It's truly sad. I know my child's journey and choices are her own. She will have to apply what she has learned from school and home, then apply to life. I want my child to have all the tools she needs to be a successful adult. A lot of children leave home and go to college without the very basics of how to care for themselves. Even managing money seems to be an issue for some because they were never shown how. Our children watch us closely and absorb our "lessons" without words. We cannot sit on the couch all day and convince our children that hard work counts. We have the power to show them how to be affirmative, industrious and committed individuals. How many of you are paying off student loans? Do you ever wish that your parents saved for your college education? This is a conversation that I had with my own father not too long ago. How he wished he would have saved money for me to attend college. Though half of my tuition was paid by scholarship, the other half had to be paid from Pell grants and student loans. I have 3 kids and would hate for them to feel the burden of student loans. My hope if they decide college is for them, is that they are awarded academic or athletic scholarships. However, just to be on the safe side, I started savings accounts for my little ones. My worst fear is that I'll be underprepared because saving money for 3 kids is a lot to take on and requires a lot of discipline on my part. In 2014 I was diagnosed with severe depression and anxiety. I was then advised to take antidepressants to help. To this day my depression, stills seems like an everyday battle. Single mothers like myself tend to neglect their own health because of their responsibilities and often downplay their symptoms. What I've come to realize is that my children are not expecting me to perfect and I'm not always going to be at 100%. Mothers are allowed to have good and bad days. My biggest fear is that I don't want to let my depression affect my ability to aid my children prosper into successful adults. Remember, it's never too late to begin thinking or preparing for your child's future. They may be 2 years old right now, but 18 will be here before you know it. Let us guide our children with words and good deeds. Pray that we set a good enough example leaving our children inspired to build a foundation of their own. PSSST CHECK THESE POST OUT TOO! Why are Kid Friendly Chores so Controversial? I'm Daisha Renee; single mama, foodie, and lover of yoga. Here on the blog, I love providing powerful solutions for overwhelmed single moms who struggle with balancing all the components of single motherhood. If social media is your thing, I would like to invite you to hang out with me in my Facebook Group. Looking forward to meeting you! 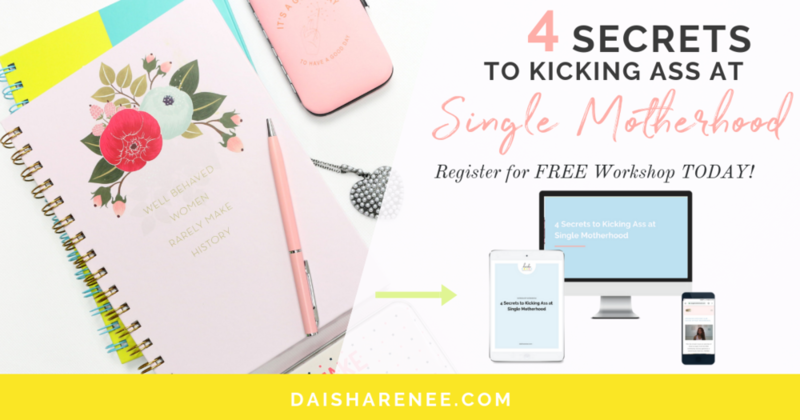 Sign up to receive blog updates, challenges, giveaways and new freebie announcements.